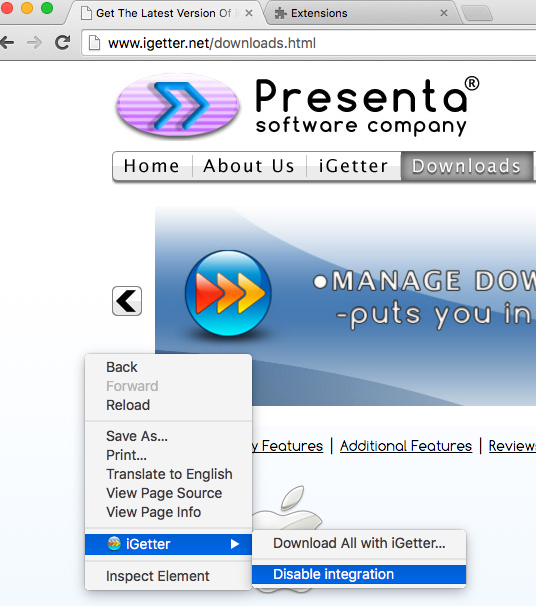 Forums - [Chrome] How to use Chrome's downloader instead of iGetter? 2. OR disable iGetter integration for all files, through the contextual menu command "iGetter" > "Disable Integration". This command takes effect immediately and remembers its state even if you restart Chrome. 4. 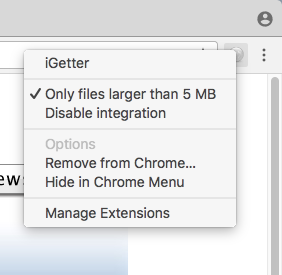 OR disable iGetter Extension permanently through Chrome Extensions Manager (Chrome menu Window > Extensions > uncheck Enable option). This option takes effect immediately. 5. OR turn off "Install iGetter Browser Extension" (or "Add Contextual menu support for Internet browsers" in older iGetter versions) option at iGetter preferences, Integration panel. This will completely uninstall iGetter Extension from Chrome (requires Chrome restart). 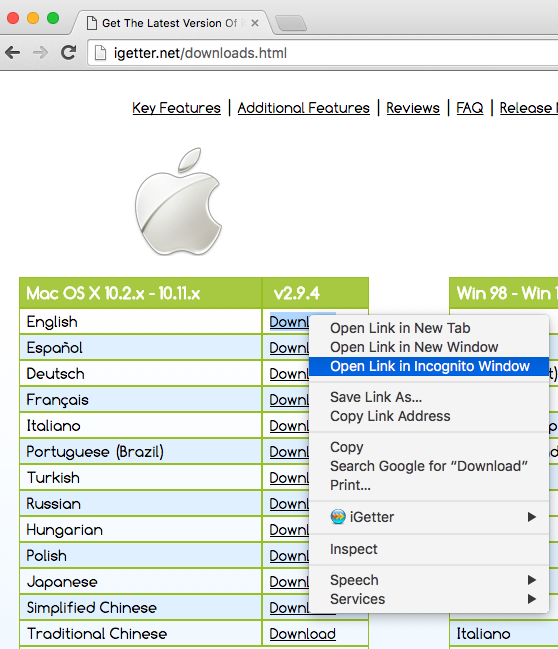 Update: Added "Open Link in Incognito Window" as an option to use Chrome's downloader instead of iGetter. There are users that complain when iGetter doesn't catch their downloads and others that it catches all downloads (when enabled). So we put an option "Disable Integration" in Chrome's contextual menu. On Windows this option is preserved on browser restart. On Mac it's off when Chrome starts. Depending on user feedback we want to choose the most optimal behavior. We also hope that Chrome will allow other downloaders as an option on every download i.e. like Firefox. Selective downloading by file type is very tricky, because a lot of downloads come with a wrong file type (i.e. dmg, attachments, etc.). Did you try the very first suggestion? By using the contextual menu command "Open Link in Incognito Window" you can use Chrome to download any file in that window from that moment on. The reply by Tim above is what I want too. The "Disable Integration" should be remembered even if we restart the chrome. Update: iGetter Extension v2.9.6 adds a new option "Only files larger than 5 MB". Also this option and "Disable integration" remeber their state even if you restart Chrome. Your current iGetter Extension should update automatically, but you may also update it immediately. To do so, open Extensions Manager (Chrome menu Window > Extensions). Then enable "Developer mode" and click on "Update extensions now" button. Your extension should update to the latest version. After the update turn off "Developer mode".